Job seekers need to think outside the box when it comes to creatively outshining the competition and landing the job. Job search strategist Kyra Mancine recommends the following thank you email for candidates who are eager to express their interest in a job. 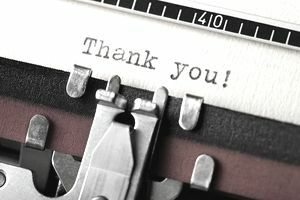 If you are in post-interview limbo, waiting for that final call or decision, a well-crafted thank you letter can help push the odds in your favor. Be sure to also check out this resume guide and cover letter template and these interview tips. I just wanted to thank you again for meeting with me and express my continued interest and enthusiasm in joining your team. From everything I have seen, learned and heard, [Company Name], is a place I want to join and be a part of. My broad range of experience, from client service and helping fulfill orders to improving customer communication, supervising others and working successfully together with a team to achieve common goals, makes me a good fit for this position. If there is anything I can do to expedite my application, I would be more than happy to do so. Whether this means providing you with references, shadowing an employee for a day or even filling in for a "trial run" one morning or afternoon," I would be eager and willing to do so. Thank you again for your consideration and I look forward to hearing from you soon.